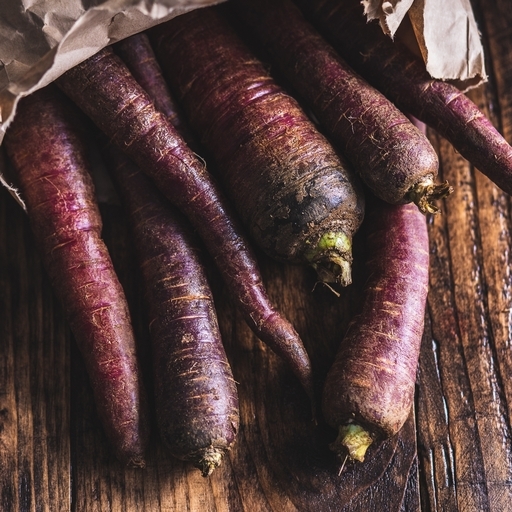 Organic purple carrots. With their dark indigo exterior and orange middle, it’s like nature designed them specially for Halloween. They taste as good as they look, and they’re jam-packed with good stuff: their vivid colour comes from anthocyanins, the same pigment that makes blueberries a superfood, and they have even more beta carotene than their orange cousins. Boil or steam in 5-10 mins. But our top tip is to avoid cooking them in water. Instead, roast them to bring out their sweet flavour, or stir fry to keep their pleasing crunch. Really fresh bunched carrots are best raw or very lightly cooked. Carrots keep for several weeks in a paper bag on a cool veg rack.